In all periods of ancient Egyptian history the dead were laid to rest with grave goods these included food, vessels, implements, weapons, jewellery, statues of the deceased and ushabti (answerers) who were to perform any duties which would be expected . 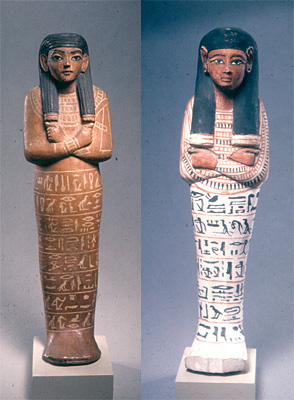 Mummification was the customary practice from the Third Dynasty (2705-2640 BC) The internal organs were placed in four vessels (canopic jars). The sarcophagi prevalent in the early dynasties were later superseded by the human-shaped coffins until the box form became popular again in Greek and Roman times. In Roman times wooden boards bearing the features of the deceased (mummy portraits) were placed on the mummies for identification. Inv.-No. ÄM 4652, ÄM 10193 Since the Middle Kingdom the defunct were expected to carry out field work in order to secure food for the inhabitants of the underworld. In order to avoid having to carry out this work himself the deceased took with him small mummy shaped figures called shawabti after their Egyptian function 'the answerer'. They functioned as a substitute for the defunct. To carry out their work they are provided with two hoes and grain sacks. According to the inscription which they carry (chapter 30 of the Book of the Death) their owner expects that 'when I am called to work, to cross over to the fields in the West, then you should answer: here I am'. 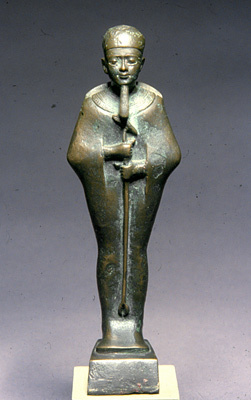 Many Egyptians provisioned themselves with one figure for each day and one overseer for each group of 10 workers. Inv.-No. 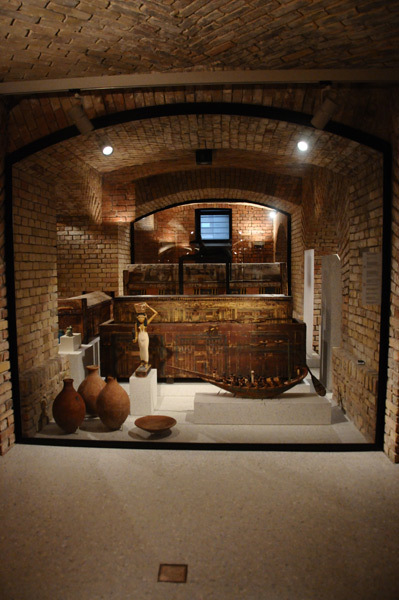 ÄM 733 The shawabti figures which accompanied the dead person in his grave were placed in specially produced containers. This rectangular painted box has three barrel vaulted lids which were originally tied to the box with string. The decoration on the four sides refers to scenes in the underworld and shows the dead Pa-en-Renenutet kneeling in front of an offering table in front of the god Re-Harachte and the goddess Isis . 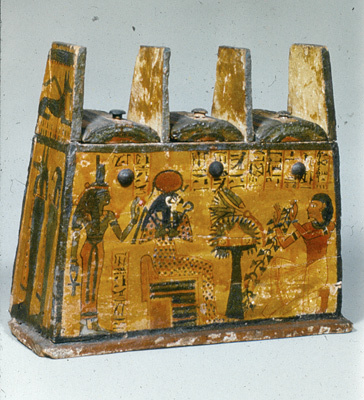 On the small sides box the four sons of Horus (protectors of the viscera during mummification) are depicted. Inv.-No. ÄM 11411 In the roman period mummies previously covered with mask for better identification were replaced in the Fayum with painted portraits on linen or wood panels. Often they are real portraits showing the person at an advanced age and painted during his lifetime. The of portrait shows Aline daughter of Herodotus who dies at an age of 35 years. The custom to place portraits on the mummy stays limited to a small area. the ca. 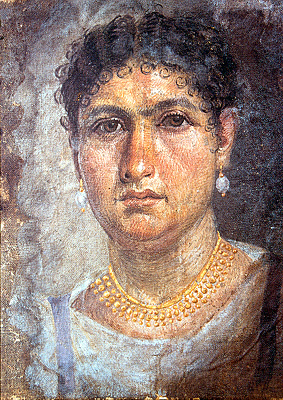 750 preserved paintings are the only evidence from Egypt of Hellenistic portrait painting. On the basis of dress, hairstyle and jewellery which orients itself on the roman emperors fashion it is possible to date these portraits precisely. Alinas curls neatly arranged corresponds to the fashion under the emperor Tiberius und whom she died in his 10 year of rule. The mummy of Alina was found together with the mummy of the husband and 3 children . Her husband and older child are covered with mummy masks wears she and the two younger children are covered with flat mummy portraits. Inv.-No. 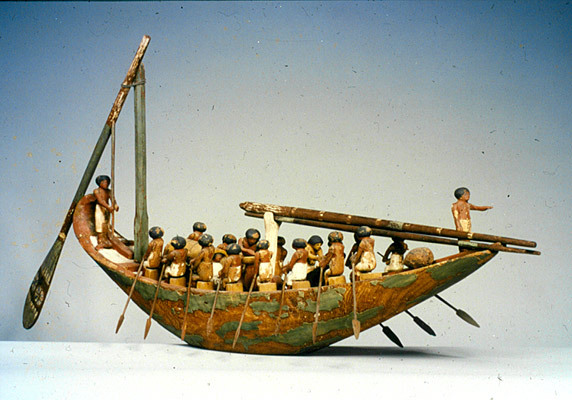 ÄM 12 The models of boats were a necessity and a status-symbol, providing for a luxurious life in the netherworld. Mentuhotep took with him his boat and crew; sitting under the baldachin he is travelling on the Nile in the netherworld in comfort. This boat was found together with many other models and offerings in the grave of this superintendent of goods of Thebes. The human-shaped (anthropomorphic) coffins are schematic representations of the deceased. The inscriptions on the coffins refer to their owner as transfigured beings. He has passed the examination by the judge of the underworld and may continue to live in the realm of Osiris. Various symbolic figures, such as the four sons of Horus depicted with the heads of a baboon, jackal, falcon and human, shielded the body from evil forces. The winged scarab symbolises the regeneration of the sun-god and therefore the rebirth of man in the afterworld. Ancient Egyptian religion expressed its experience of the existence of God in many names and images.Human form, animal form, holy objects and cosmic symbols are equally appropriate as images of God. The allocation of the gods to their main places of worship is an attempt to classify the forms and names of the divinities and at the same time to visualize the confusing multitude of forms and numbers. Inv.-No. 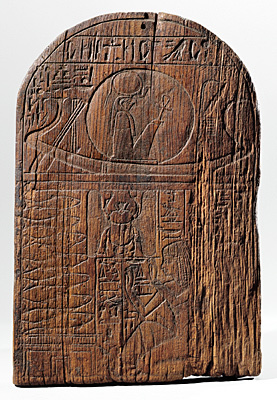 ÄM 818 The previously painted wooden stele is decorated at the top with the sun bark and the falcon headed Horus in the sundisc. 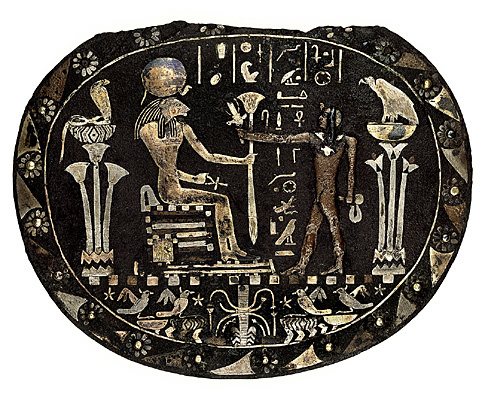 In the middle a large winged scarab accompanies the text in which the donor praises the various manifestations of the sun god. In some graves of the New Kingdom a litany 75 such transformations are counted. Only the title of the owner is preserved as a 'servant in the city of the truth' he belonged to the arts and crafts guild in the valley of the kings in Thebes. Inv.-No. ÄM 23733 This bronze disc is the counterweight to a necklace called Menat by the ancient Egyptian. Inv.-No. ÄM 4580 Many objects which were used in the daily cult or on special occasions for the gods were found in the temples. Besides more common items such as vessels for holy water sensors and music instrument more specific objects such as this throne for a figure of Harpocrates were present. 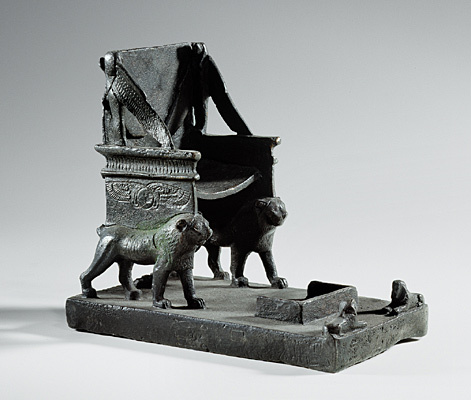 The side wings are formed as the wings of a protective goddess the throne is carried by two lions and at the front two sphinxes are pictured. this ornated design gives an indication of the splendour with which the temples were furnished. Inv.-No. ÄM 23706 A particular form of cult object of Egypt is the Aegis, made up of a necklace and the counterweight of the menat both fashioned in bronze. 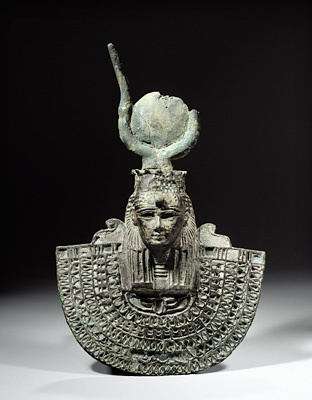 The necklace is topped by the head of the goddess Hathor shown with the horns of a cow. During processions in honour of the goddess this object as well as systrums (rhythm instruments) were usually carried by the priestesses. Inv.-No. 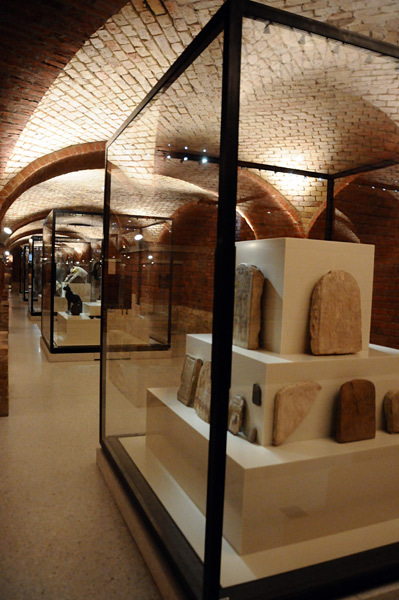 ÄM 2423 Names and pictorial representations of gods are know to us from the Predynastic times. In the following centuries small statues were placed in shrines in the temples whereas in the Late Period private person placed statuettes of gods in the temple in order to ask for, or say thank for received, favours. Even though particular characteristics were usually assigned to a particular god overlapping was possible. The god Ptah the city god of Memphis is shown in mummy form wearing a tight cap with a long band which hangs from the neck down the back. He carries a 'was'-sceptre the symbol of power. As patron of the arts and crafts he was very popular not only in Memphis but throughout Egypt as the great numbers of statuettes representing him attest.